In February 2008 900 Buddhist Shugden monks were made homeless by the Dalai Lama? There are so many wrong and misleading claims and allegations by the International Shugden Community (ICS) / New Kadampa Tradition (NKT) that it is almost impossible to address and to correct them all. Joanne Clark’s blog and this blog made some efforts to correct some. There were also efforts by others (including the CTA, Buddhist (Head) Organizations etc.) but the ICS / NKT / Shugden groups still flood the media, interview partners of the Dalai Lama, journalists, Buddhist centres, the internet, news comment sections, YouTube (and also this blog) with false information. Recently, a senior NKT teacher, Kadampa Ryan, repeated in the discussion thread of the “Declaration by New Kadampa Survivors concerning the Demonstrations against His Holiness“, the claims of the ICS/NKT, that the CTA/Dalai Lama had made Shugden followers “homeless”. To make it more easy for Ryan and others, here some of the facts. In February 2008, as a direct result of the Dalai Lama’s demands, 900 Buddhist monks were made homeless. But the facts, are, that after the Vinaya ‘Stick Referendum’ that is part of the monastic training for Buddhist monks and nuns, laid down by the Buddha and one of seven ways to settle conflicts (and which is deeply democratic), the majority of the monks in the three main Gelug monsteries (Ganden, Sera, Drepung) in India decided to separate from Shugden monks if they wish to continue their worship. Those who wanted to stay had to give up that practice. This is how things are done, if there is trouble, either your find a compromise or you have to separate if that is not possible. It is also common and part of democratic processes that a majority vote has to be accepted and respected. If a community decides based on majority vote that you cannot smoke on the group’s assets, then those who want to smoke have either to go or to abandon smoking (or you find another way that concords with the majority decision). This is really not an unusual or even criminal or oppressive behavior as the Anti Dalai Lama Campaigning Group wants to make the world believe. All the monks who had to leave, got a fair share of the houses and property of the whole community. There is no doubt about it that this was the case, and even the deceptive Pro Shugden Site www . dorjeshugden . com acknowledges this fact. Here some excerpts, screenshots and commentaries to their own statements. Below you find two images about the “desperate state” of the poor, made homeless by the Dalai Lama, Shugden monks in India. … the existence of Shar Gaden and Serpom monasteries, established for the sole purpose of preserving and upholding Dorje Shugden’s lineage and ractices. 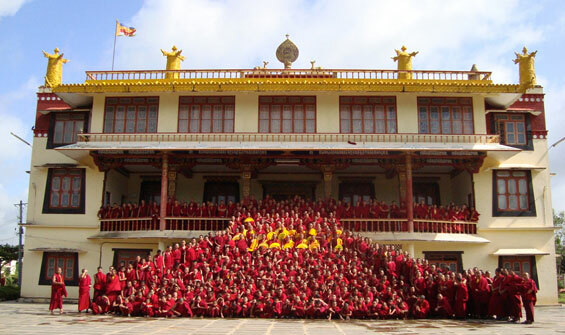 Both monasteries are open and thriving, and their activities encompass the full range of monastic programs including Geshe degrees, initiations and oral transmissions, international tours, Buddhist festivals and celebrations. These two eminent monasteries are and will continue to be an educational base for high Lamas such as Domo Geshe Rinpoche and other future lamas to come. They are learning centers, hubs from which Dorje Shugden’s lineage is practiced and transmitted, and where Guru Devotion is strong and powerful. … the very existence of these monasteries is a thorn in the side of Ganden, Sera and Drepung monasteries because they are right next door! More importantly, they are out of the CTA’s reach. The CTA cannot touch them, cannot close them down, cannot harass them, cannot do anything to them because they are legal entities licensed and protected by the Indian government. Getting the land by their claimed “evil oppressors” and accusing the CTA to only aim to “close them down” and “harass them” is totally deceptive and wrong. Nicolas Tessier Saying they had no proper source water is false as, up until last year, many of their water pipes where still connected to the main feeding source of Sera Mey. Those who were in residence in 2013 will remember well the drought that affected us leaving the Sera Mey kitchen, main building complex and various housing group with NO water. Hence, Sera Mey requested Serpom to find an alternative source for their water for which they complied and the matter was settled peacefully and without a hint of conflict. From 2008 to 2013 give us a gap of 5 years for which they were provide with water. Siling Tongkhor I concur with what Nicholas has written above. Especially the case with water pipes. We were sharing the same water (coming from the Sera Mey water tanks) for the last 5 years from 2008-2013 after the separation. The following excerpt by the Pro Shugden Site is a mix of truth and untruths (lies) – first they said Serpom was left without a prayer hall, now it has been changed to “without a properly sized” prayer hall. The Pomra monks fit comfortably in their old kangtsen prayer hall before the new elaborate one was built. As you can see from the following quotes, not even the (deceptive and anonymous) Pro Shugden Site makes claims of “homelessness”. 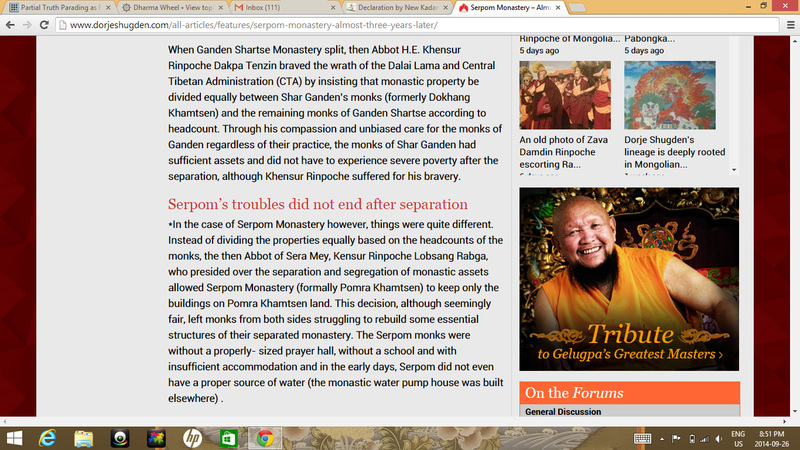 When Ganden Shartse Monastery split, then Abbot H.E. Khensur Rinpoche Dakpa Tenzin braved the wrath of the Dalai Lama and Central Tibetan Administration (CTA) by insisting that monastic property be divided equally between Shar Ganden’s monks (formerly Dokhang Khamtsen) and the remaining monks of Ganden Shartse according to headcount. Through his compassion and unbiased care for the monks of Ganden regardless of their practice, the monks of Shar Ganden had sufficient assets and did not have to experience severe poverty after the separation, although Khensur Rinpoche suffered for his bravery. *In the case of Serpom Monastery however, things were quite different. 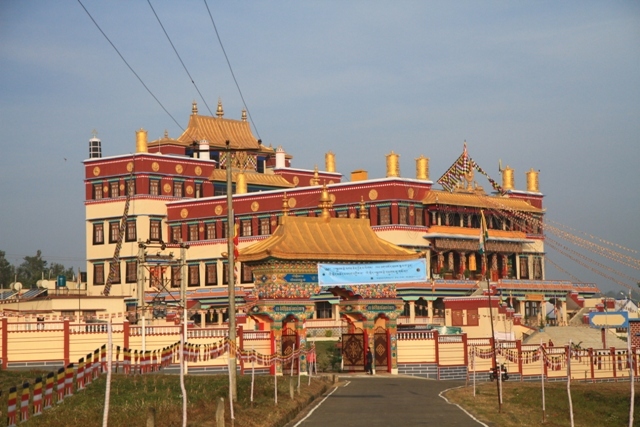 Instead of dividing the properties equally based on the headcounts of the monks, the then Abbot of Sera Mey, Kensur Rinpoche Lobsang Rabga, who presided over the separation and segregation of monastic assets allowed Serpom Monastery (formally Pomra Khamtsen) to keep only the buildings on Pomra Khamtsen land. This decision, although seemingly fair, left monks from both sides struggling to rebuild some essential structures of their separated monastery. The Serpom monks were without a properly- sized prayer hall, without a school and with insufficient accommodation and in the early days, Serpom did not even have a proper source of water (the monastic water pump house was built elsewhere) . 3. 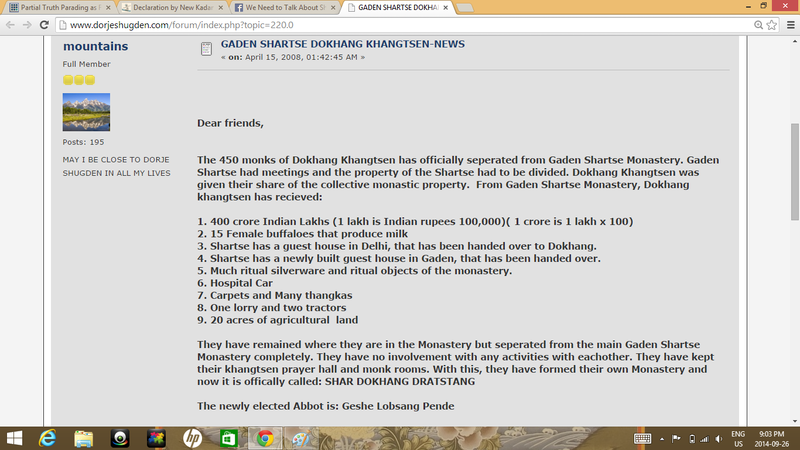 Shartse has a guest house in Delhi, that has been handed over to Dokhang. 4. Shartse has a newly built guest house in Gaden, that has been handed over. 5. Much ritual silverware and ritual objects of the monastery. * The Sikyong told to one of my reliable sources, that the CTA gave the land to the Shugden monasteries. This claim makes sense, because the Indian government gave land for the Tibetan settlements to the CTA (formerly TGIE), the exile government of the Tibetans. According to my knowledge, the CTA is in charge to use those settlements / land according to the needs of the Tibetans. … The land where Pobhor Khamtsen of Sera Mey Monastery has built their living quarters and now the monastic building, was given by CTA not the Government of India. Of course every inch of Tibetan refugee land belong to the government of India and not an iota of Indian land belong to Tibetans. The land was under CTA’s undertaking and after the split, was allotted to the remaining monks of Sermey Pomra Khamtsen, which has earlier, housed the largest number of Shugden worshippers prior to the separation in 2008. In keeping with the principles of the Dharma and the Vinaya, ‘the mouth was distinguished from the moustache’ during the proceeding of Tsulshing [‘Stick throwing’- a monastic form of democratic referendum] in Gelugpa monasteries in 2008. Nobody was asked to leave the monastery; it was in fact left for the monks to decide where they wished to live. As was said earlier, it is true that a small number of people continue to live [in Gelug monasteries] with numerous rights. At present, there are the so-called Shar Gaden Nampar Gyalwayling and Serpom Khangtsen monasteries in Mundgod and Bylakupee respectively, [populated by Shugden devotee monks] who are living on the lands provided by the Indian Government at the request of His Holiness the Dalai Lama. The Tibetan Administration has never asked them to leave the land. If they voluntarily decide to leave, they are free to do so. There is no prohibition from the Tibetan Administration but rather there are words of appreciation. During the meeting of Tibetan Settlement Officers last year, a clear directive was issued that everyone is equally entitled to the rights enshrined and this directive still remains valid. There is no discrimination regarding this issue. To reconcile both information … maybe after a request from the Dalai Lama, the CTA gave the land, originally donated and designated by the Indian Government for refugee usage, to the Shugden monks. Thanks for putting all the information in one place Tenzin, now people have no reason not to inform themselves. Thank you for your invaluable input and help! I updated the post. The Shugden monks got the land based on the request of HH the Dalai Lama from the Indian government! I updated the post again. The Sikyong himself said, that the CTA gave the land to the Shugden monks. Thank you for posting this information, it certainly makes for interesting reading. I am sad that the monasteries had to split, but glad that the property seems to have been divided more or less equitably. It is also good that the land was given at the request of the Dalai Lama. At this time, I do want to clarify one thing, though. You say above that I repeatedly made certain claims even after information was presented to me to the contrary. This is not correct. The exact sequence of events was I made a claim, Khedrup clarified, that same day on Joanne’s blog I made a similar claim. As I explained, everything I wrote was done more or less in one sitting before I had a chance to read through everything that had been said in response to me. Once I had done so, and I internalized what was written, I then said I would not make the claim again until I had a chance to clarify things. And I haven’t done so. If you claim we need to stay true to the facts, please don’t distort them as regards me and my actions. It is also true that I haven’t had time to investigate these particular facts myself because, as I explained, I have a demanding job, 5 kids and a wife, as well as all the normal things one has to do to keep their life in order. I apologize that such constraints prevent me from looking into things on the time scale you feel necessary. In any case, I once again thank you for providing the information you have in one place. I now better understand one side of the story, and it has corrected some misunderstandings I have had. I only glanced through the comments and replies in that thread very quickly (which is not a good method to get a precise understanding), and according to you, I distorted the order of the events how the communication unfolded. I apologize for this fault of mine sincerely. I am sorry. At the moment I lack time to check this and I just trust you. I will remove now from the post the things which you point out here to be a distortion of the events. I hope to find time later to go through your replies in the thread. If there are more faults, please let me know. Again thank you and best wishes! Always happy to help, especially when the deceptive nature of the misinformation is so clear. Indeed I wonder how they will explain this correction away, as it cites evidence from a pro-Shugden website to make its point. But I am sure that NKT will invent some new narrative to explain why their misinformation still holds. But nothing we can do about that. The information is here, whether they decide to be free thinkers or not is up to them. Thanks for at least acknowledging this information. It says a lot about you. Just as Tenzin’s posting of information not necessarily favourable to his “side” in this dispute says a lot about him. I personally will be really happy if these lies about excellent monasteries that produce very fine teachers and practitioners are withdrawn. They don’t deserve to be maligned in this way. Khedrup, what do you mean with “if these lies about excellent monasteries that produce very fine teachers and practitioners are withdrawn”? If the ISC/NKT withdraws the lie that Gaden and Sera monasteries kicked hundreds of monks out of their housing into the street. I would be so happy and it would show me that the ISC/NKT is actually interested in reaching a compromise, rather than trying to destroy the DL and non-Shugden Gelug monasteries (which is my impression at the moment). This particular lie about homelessness is one of the most damaging they tell about HH Dalai Lama and the monastic communities in India. Making people homeless is an extremely serious allegation. These monasteries are unique places of monastic training and dialectics, and when they are maligned in this way based on false information it makes their already tenuous existence more difficult. It breaks my heart to see good people lied about.